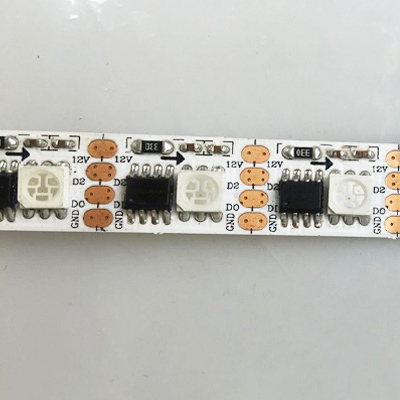 GS8208 is a type of double data led strips, with the advantage that when one led broken down, the signal continue transfer, and the other leds still work without any influences. It is the same function one further to the ws2813 led strip, but non built-in IC, quality good for project. Even our GS8208 LED Strip is 12v, but still each pixel addressable, each led with one GS8208 IC programmable. Besides, for installation, the 12v voltage is much convenient for clients and to some extent better solved 5v led strip voltage drop issue.